The laundry room is one of the most used areas in a home and yet, is usually one of the rooms given the least attention when designing a home or remodeling. It is often poorly designed and as an afterthought, it is tucked away in a basement, crammed into a closet or combined with other areas that just don't work well together. If you are building or remodeling and you consider the location and design of your laundry room, above all else, be practical. The extra touches are easier to add if the design is done well. In one home where my family lived, the laundry area was in a hallway leading to the downstairs powder room. Not only was this inconvenient, but it was a safety hazard as we stepped over piles of laundry and baskets on the way to the powder room. And, I had to make the extra effort of keeping the area looking neat at all times for guests. Since the laundry room did not have a door and was accessible all the time, closed storage was essential for both neatness and to keep dangerous laundry products away from young children and pets. A better choice is to locate the laundry area away from often used traffic paths or make it large enough to easily accommodate foot traffic whether in the garage, basement or living area. Why not place the laundry room near the largest source of dirty clothes? Perhaps not just your teenager's room, but all of the bedrooms. If your home is a split-level or multi-story, a laundry room on the second floor can easily fit in small spaces and save many, many steps up and down stairs. It's also a great way to encourage children to be responsible for their own laundry. Second-floor laundry rooms are becoming quite common and are convenient to bedrooms and baths. What steps should be taken to prevent mishaps with washers and potential water damage? To prevent a disaster if a washer overflows or a leak occurs, install a recessed washer box in the wall directly behind the washing machine. Choose a box with the single-lever shut-off valves included, and mount the box for easy access. This recessed box provides connections with shut-off valves for the water supply hoses and a drain for the washer's discharge hose. Install a washer drip pan under your washing machine. Set the tray so it has a direct line that pumps into a laundry sink drain or floor drain. If the machine leaks, the water will be drained away. In some new homes, the laundry area is placed in the master suite, between the closet and the master bath. In others, the laundry room is more visible in what designers call “the family foyer” or the mudroom, the place at the back of the house where family members enter. The laundry workspace also includes storage for sports supplies, coats, and shoes. The kitchen is the hub of most homes. So why not put the washer and dryer in the kitchen? It may seem efficient but laundry rooms produce high amounts of humidity, dust, and lint. You don't want this near food preparation areas any more than you want food and grease near your nice, clean clothes. You should also resist including the laundry area in a multi-purpose room. Humidity and noise don't mix well with other activities. If the washer and dryer must be part of a larger area, consider installing insulated walls to confine the workspace. In the real world, the perfectly placed and designed laundry room just isn't always possible. There may be a space problem and limited finances. 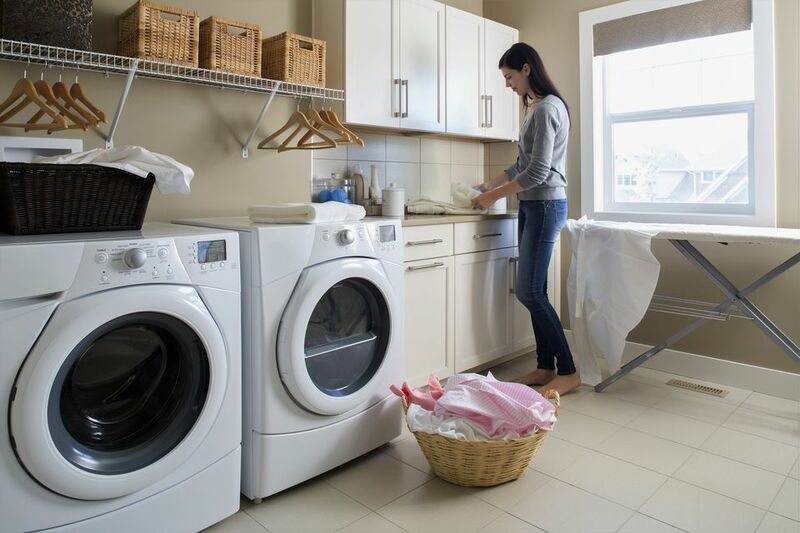 For many homeowners, a "bad laundry room" is better than not having one at all and having to use a laundromat or communal laundry room. An accessible laundry area becomes increasingly important as we age and want to remain in a home as mobility decreases. If space is a problem, look at closets that are near a bathroom or kitchen that can accommodate a washer and dryer. Having plumbing already nearby will save thousands in installation costs. Smaller, stackable units are a very good solution.